It's no secret that ice cream is yummy, but that sometimes it's just too cold to eat it... okay... maybe it's never too cold for kids to eat it, but it's too cold for parents to imagine serving it to their children to eat it. That's where fake ice cream comes in. It's Winter in Australia, so there's no way that an ice cream as an afternoon snack is a great idea, but try telling that to two preschoolers who have arrived home after a car trip in which the 3 year old has lectured the 4 year old about a book they apparently read which mentioned ice cream, and she's been obsessing about it ever since. 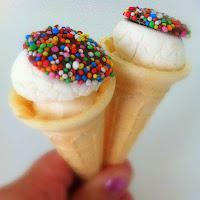 mini ice cream cones - one per child - check! white marshmallows - two per cone - one normal marshmallow to pop inside the cone, and one to go on top after it's been given a good squashing on the kitchen tabletop to flatten it down and make it wider and flatter - check! chocolate sprinkles or 'freckles' as we call them here - to stick on top to look like chocolate topping - check! I served my daughters their 'ice-cream' and they cheered, and then they laughed when they realised they weren't real. I held my breath to see if junior was going to spit the dummy and chuck a wobbly, but no, she was content to eat her sweet treat ice cream substitute, and every one was happy. Sometimes it's ok to stand your ground in parenting - so long as what's on offer is as good as what's on demand! Besides, I now have a super easy party food idea I can serve up at the next get together that's a whole lot less messy than icky-sticky melting ice cream.